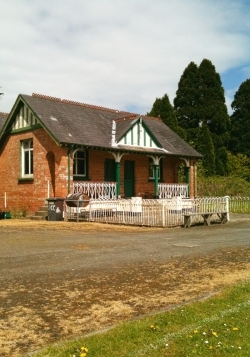 Donaghcloney Cricket Club has been synonymous with village life for well over a century (approximately since 1888), plying their trade at the Factory Ground. Set in a meandering bend of the River Lagan and with a back drop of Liddell’s old Linen Factory it truly was a picturesque site. In modern times with the demise of the Irish Linen trade, we have seen many changes in this once unique setting. 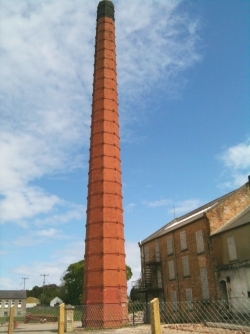 The old red brick factory is now in the process of demolition and will be replaced with what is likely to be housing, although the landmark of the ‘Chimney’ and some older ‘listed’ parts of the captivating factory will be retained. The Club will continue in their aspirations to maintain their status of being a key focus in the community. We will strive to provide a sporting outlet not only for the long associated family names but also for those new to the burgeoning village population, within an environment of friendly banter with a competitive edge. Why not find out for yourself – find out when the next match is on! DONAGHCLONEY is the perfect personification of village cricket! The origin of the club is classically traditional. It owes its emergence to the interest in the game of the linen firm, which is intrinsically bound up with the history and well being of the community. No story about Donaghcloney, be it cricket, commerce or the craic and humour for which this rural corner of the Co. Down countryside is famous, could be written without reference to the Liddell family. The ancestry of the Liddell’s and the part they played in village life has been skilfully and racily chronicled by Robin Liddell, who played a major role in the development of Donacloney cricket. Robin, following in the footsteps of his father William and others before him, had an upbringing common to those of his class and station. He was educated locally at Lurgan College and then went on to Harrow. 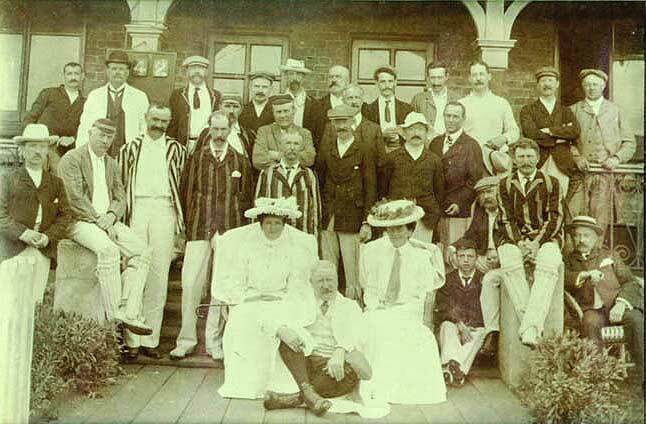 His experiences at Harrow and elsewhere are recalled in a publication, which he calls somewhat modestly, and self-effacingly ‘The Memoirs of an undistinguished Cricketer’. It is an outstanding work of reference on the history of Donaghcloney Cricket Club to which the author has been happy to turn not only inspiration but, to pull together the threads of a fascinating and remarkable story which began in the latter years of the 19h century. It all started with a fortuitous decision in the middle of the 1880’s, the sending of the then 14 year old William Liddell to Donacloney where he served his apprenticeship to the linen trade with his Nicholson relatives who were the prosperous bleachers. It was William Liddell, showing what his grandson Robin describes as outstanding ability and drive, who founded the firm William Liddell & Co. William Liddell was to live to see not only his ambitions for the company but his four sons, William junior., Harry, Robert and Charles come to fruition. The linen entrepreneur wanted the cloth he manufactured to become known around the world. It was as objective he was to gloriously achieve. The brothers Liddell had their first sporting contact in the Province through the North of Ireland Cricket and Rugby Football Club. This was indirectly the lead in to the introduction of cricket in Donacloney, primarily to provide the factory workers with a recreational pursuit. Indeed the linen weavers, helped make a ground and lay the pitch in the largest field at Banoge House, the family seat of the Liddell’s. This was the original Donacloney cricket ground, the square later being transformed into tennis courts. The Factory Ground site, where the club currently has its headquarters, was developed under the watchful eye of Charles Liddell, the youngest of the brothers, then in charge of the factory. It embraces the magnificent and historic Nicholson bleach green, adjoining the factory buildings. The ambitious project was probably ahead of its time, taking in a large oval, measuring 160 yards by 200 yards with a banked cycle track running the perimeter. The continued prosperity and burgeoning of the linen trade made expansion of the Liddell complex inevitable. It happened towards the close of the century, encroaching on the cricket pitch. This gave the ground the unique shape it has today, half oval and half triangle, the short-lived cycling club being cut off in its prime. Robin Liddell claims, and few would be disposed to argue, that Donacloney ground was, and is, one of the finest in the country. Robin himself was to make his first impact as a Donacloney cricketer in 1926 after leaving school, the first team then being in the Ulster Junior league. They were under the captaincy of his brother William, who in 1925 scored a cup final century against St. Mary’s, striking the winning runs at 10.00pm with the lights on in the pavilion. Robin joined brother William in the first team for the last match of the season 1926 at Bangor, recording that Donacloney were beaten, his only contribution being to take a slip catch at second slip. He makes some interesting comments on the dress sense of the Donacloney players, something of a culture shock for a man used to turning out in immaculate white at Harrow. The young men of Harrow played their cricket with shirt collars slightly turned up, their working class Donacloney counterparts favouring the much more functional collarless shirt. Those players who wore a cap settled for the ordinary every day “duncher”. In fact, old timers in Donacloney swear that in one instance an opponent came out to bat wearing a bowler. Factory workers wages in the middle of the Twenties, of course did not run to the purchase of finery for leisure activities. In fact most of the Donacloney cricketers walked straight off the shop floor onto the cricket field. Extracted from the Donaghcloney Cricket Club Centenary Brochure. Find Donaghcloney on Google Maps.